Apparently, (although don’t quote me on this) Beinn an Lochain was once thought to be a Munro …but with the introduction of better measuring devices it was found to be short of the magic 3000 ft / 914 m. That said, at 901 m it still rises above many of its Arrochar neighbours and more importantly, is probably one of the best of the group. Its fine northerly ridge has enough rock, steepness and drops to make you feel like you’re climbing a proper mountain (well, it certainly does if you can’t see where you’re putting your feet that is!). The problem though for me with this hill is that although I’ve teetered my way up it’s ridge three times in the last ten years….I’ve never seen the upper section of the hill properly, let alone had a view from the top. Twice we’d been there in thick cloud and rain. The third attempt was with Air na Creagan back in early winter a number of years ago and although it started off clear, by the time we were three quarters of the way up …it filled in and the fine views with all the hills dusted in snow, had gone. Every time we’ve driven over the Rest and Be Thankful I’ve looked up and thought that I must climb Beinn an Lochain again …but on a clear day. Apart from just wanting to see it, I really wanted to get some photos, perhaps even some quick sketches of the ridge …they might be good for a new painting. So then, on Tuesday, with both Nita and I working Wednesday and with a good forecast, we were looking for a ‘short’ day …nothing too arduous – Beinn an Lochain seemed the perfect place to go. The trouble with forecasts that say ‘60% chance of a cloud free Munro’, is that I always forget this also means that there’s a 40% chance of there not being a clear top! When we set off from Irvine at 06.30 there was blue sky above, but by the time we were going over the Erskine Bridge we were under a heavy slab of dark low cloud and on reaching the southern end of Loch Lomond ….well, the hills were shrouded in dark grey mist right down to about 600 m. Blast! Already my chance of finally getting a view from the top of Beinn an Lochain were looking bleak, but it was early and so perhaps in time this blanket of cloud would lift and break. So, what to do? It didn’t seem much point to start walking straight away ..it wasn’t going to clear that quickly and so instead we stopped at the car park at Luss and went and got ourselves an early morning cup of tea from the wee shop there. This is a well stocked little place and was open when we got there at 07.45, so pretty useful as a watering hole when you’re heading for a hill. There’s toilets next door too, so what more do you want?! A view possibly …or that was probably the opinion of the group who arrived on a coach while we were drinking our tea and looking at the cloud. It didn’t look too promising but there were just a few minor breaks and bright patches by the time we arrived at the car park at the top of the Rest and Be Thankful. We decided to stall further …and put the seats back and had a kip for a while. On waking, it did look a little better and there was nothing for it but to get the boots on and go. We’d already ‘killed’ almost two hours, we couldn’t leave it any longer. Our plan was to traverse the hill, climbing it by its northerly ridge and descending its steep grass and crag covered southerly flanks. 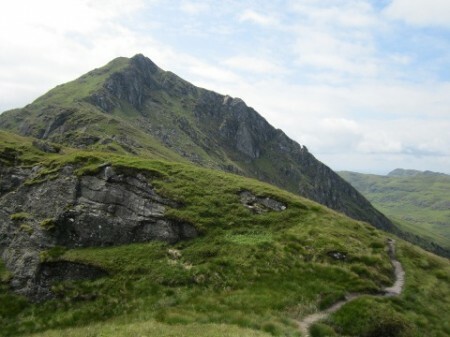 This involves walking the road from the car park past Loch Restil to a point where you can cross its out flowing stream and pick up the path that leads all the way up the ridge to the summit. Thankfully the stream wasn’t full and crossing it was easy (not always the case) and we were soon on the rough path that picks its way up the ridge. This involves clambering up many rocky little outcrops as the path gains height quickly. 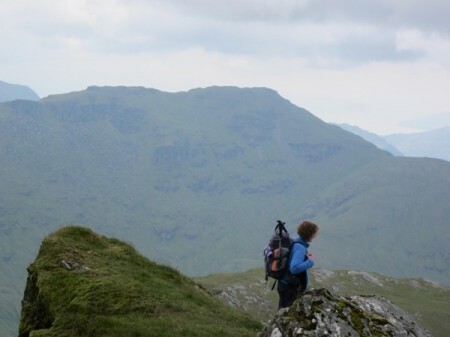 We weren’t the only thing going up though, ….looking across the glen we suddenly realised we could see the summit of Beinn Luibhean and even Beinn Ime at just over 1000m was now almost clear! It was still grey but things were improving fast. After a while we reached the first short level (ish) section and got a glimpse of the top. The steep rocky sections ahead look quite impressive without cloud and I had to make myself remember that despite their appearance, the path did wind its way through and around the crags. It was certainly a challenge in places especially where the narrow path went along the edges of the ridge …not places to misjudge the width of the path! By this stage we even had some weak sunshine and the mountain looked superb. 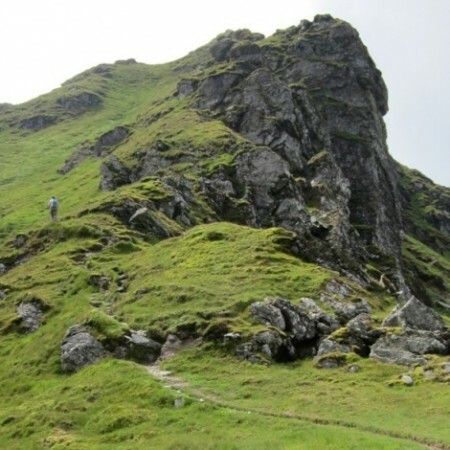 The final steep section is very impressive passing a large and imposing crag before arriving suddenly at the summit cairn. We had finally done it …we were at the top of Beinn an Lochain and had a view – albeit a rather dark one. The sun had been brief and the cloud although now higher, was dark and quite heavy. A woman we met near the summit said she’d heard rumours of thunder and lightening for the afternoon ….and it certainly felt like it. Not really a place to sit and do a sketch or two but I had a good look around and took some photos ….and then we were off. 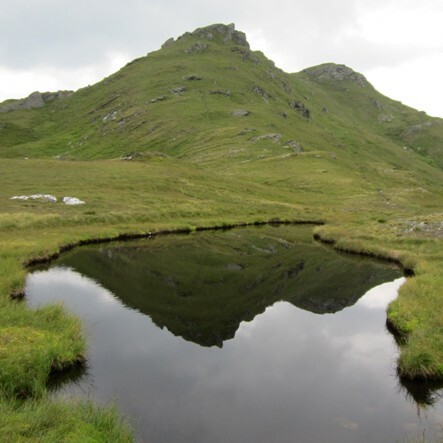 Our route took us off the immediate summit and past a wee loch that reflected the hill beautifully. After that, it was a steep descent down grass slopes, avoiding crags. The grass was long and there were masses of flowers growing too, including numerous flowering thistles …beautiful but not good if you sat down in the wrong place! It was a tiring descent and a hot and sweaty one too. The skies had become very dark and threatening but we got back to the car before any serious rain fell. It was a wonderful day and one from which I hope to get a few paintings in the future. If you haven’t been up this hill….well, I strongly recommend it. For fully sighted folk it’s a relatively short day, for those who can’t see too much, it’s quite a challenge.